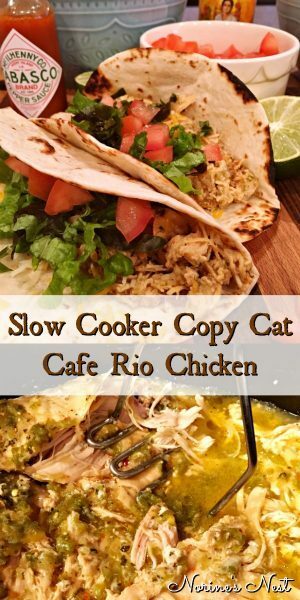 Slow Cooker Copy Cat Cafe Rio Chicken is made from boneless skinless chicken breasts simmered in a zesty flavorful Chili Verde sauce. 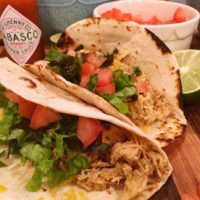 It is a fantastic easy way to prepare chicken for tacos, burritos, and all your favorite Mexican dishes! Confession time! (Yep…time for another “bird lady” confession) When go to Cafe Rio or Costa Vida (let’s face it…they’re kissin’ cousins in the world of Tex Mex!) I ALWAYS order the grilled steak. If they’re out of steak…which seems to happen a LOT…I order the chicken! 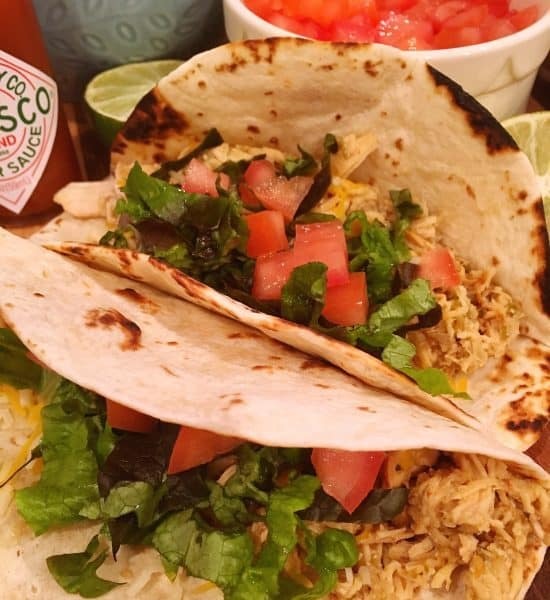 The Cafe Rio chicken is tender, juicy, and loaded with the most amazing flavors. I wondered for years how they made their chicken, and if it was possible to duplicate it at home? Good News…it is. There’s a lot of recipes out there for this particular dish…however, I honestly think this recipe is BEST! It’s easy to make and the most flavorful one out there! 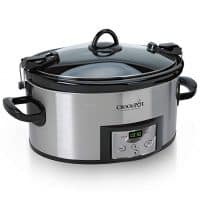 Haul out the Crock-Pot! 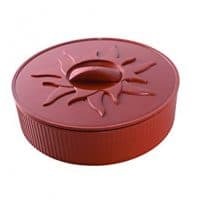 It’s in the cupboard next to the bread machine, air fryer, Instant pot, and George Foreman Grill! 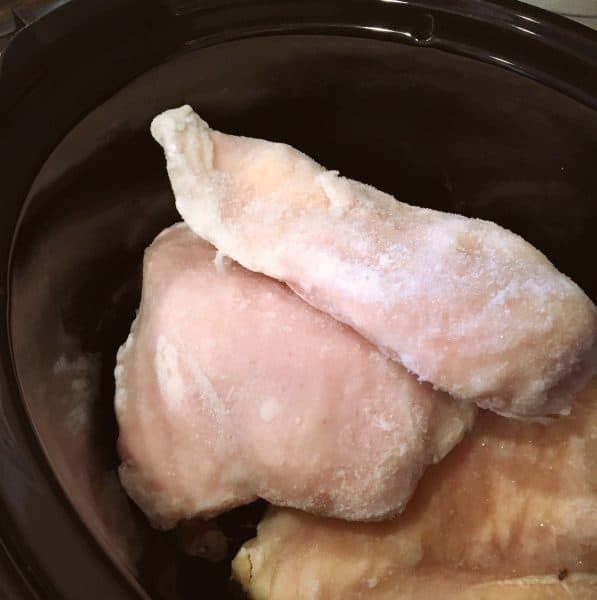 In the slow cooker add 4-5 frozen, or thawed, boneless skinless chicken breasts. If you’re using Costco Chicken Breasts… (Which I’m convinced come from the Poultry Plastic Surgeon for Hen Implants! I mean…those are some well endowed Hens at the Costco Farm! )… You can just use three Costco Implants! Add 1 1/2 cups of Zesty Italian Dressing. Yes I said “Italian Dressing”! I know…I thought the same thing first time I made a version of this recipe too. You’re just going to have to trust me. It’s AMAZING what a little Italian flavor can do to a Mexican dish! 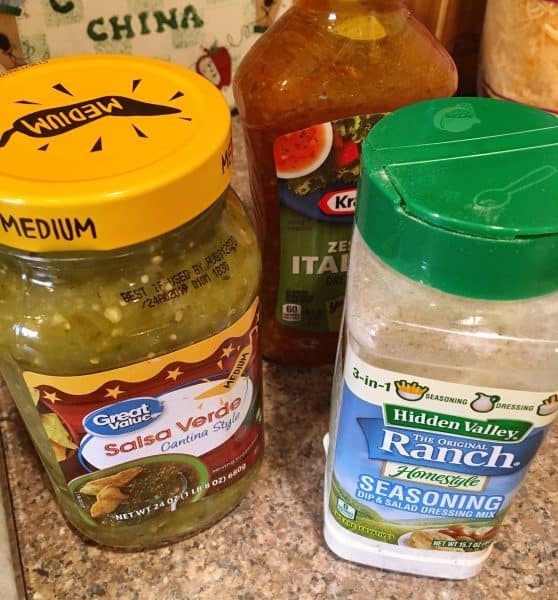 Next up… 2 cups Medium Salsa Verde. Cover and cook on low for 6 hours for thawed chicken breasts and 8 hours for frozen. Also it will depend on the temperature of your slow cooker. They don’t all cook the same any more. So be sure to check it after about 5 hours. 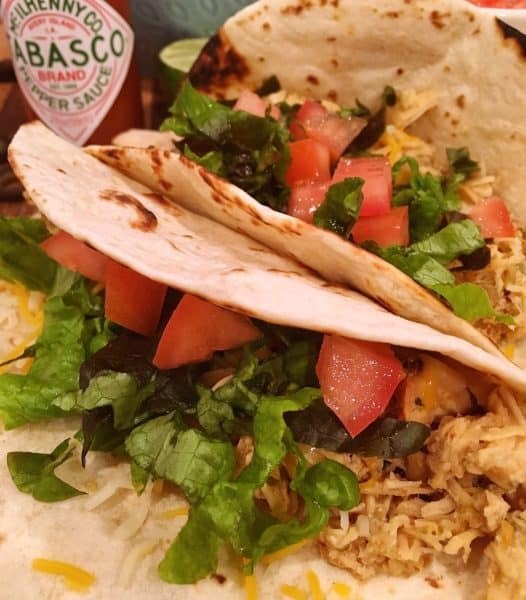 Your house is going to fill with the delicious smells of Tex Mex! Close your eyes and you’re on vacation! It’s the most heavenly smell. Every time I make this dish Mr. Nest asks what smells so good! It’s THAT amazing my friends. Truly amazing! Look how tender and juicy that chicken looks. Isn’t it spectacular?!! Do NOT drain the juices! I know…it looks like too much liquid. It’s not! Again…it’s a trust issue in our relationship! lol This chicken should be extra juicy. 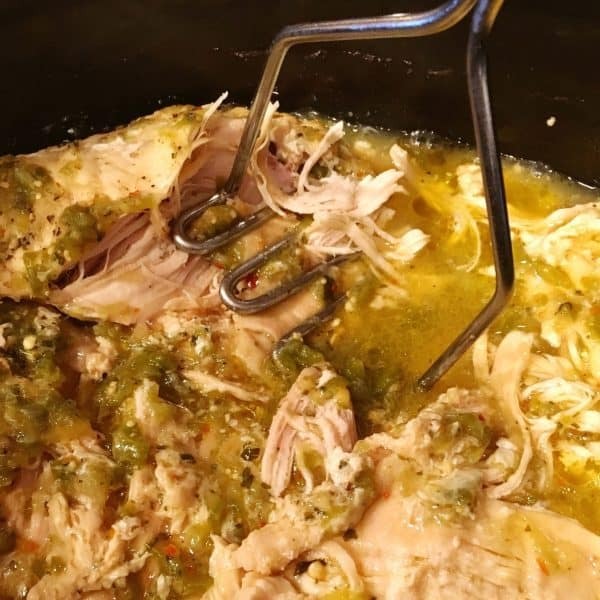 I use an old-fashioned potato masher to shred my slow cooker chicken. It works like a charm. Just get in there and use all your elbow grease, pent up issues…like hens with implants… and shred that chicken up right in the juices. 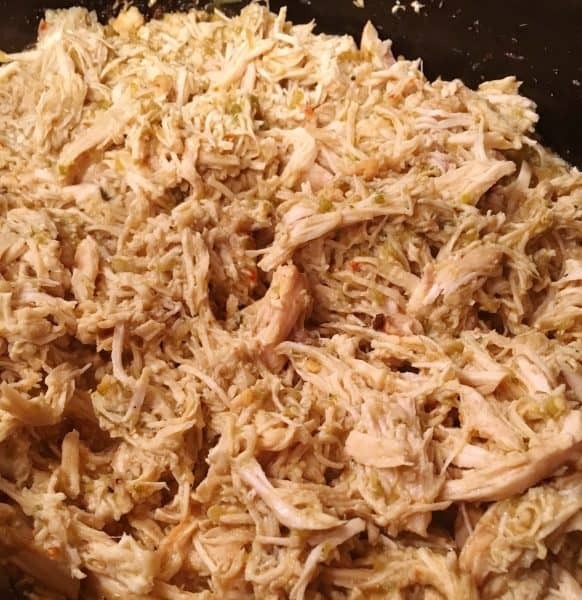 Combine the juices in with the shredded chicken. Cover and keep warm till ready to serve. 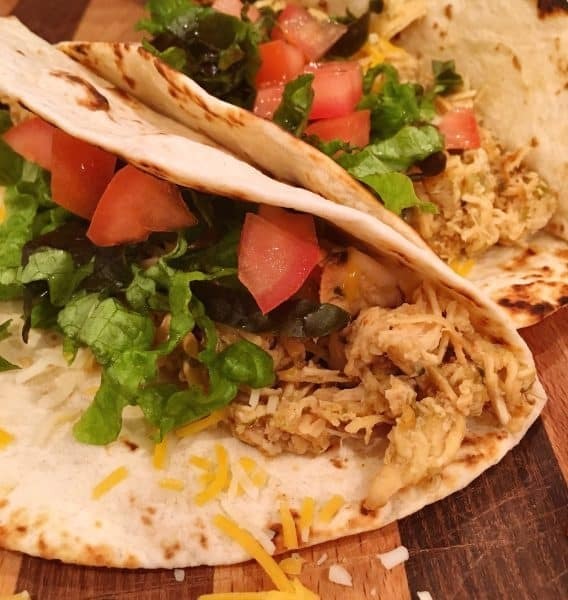 The Copy Cat Cafe Rio Chicken is ready for tacos, burritos, nachos, and even quesadillas. 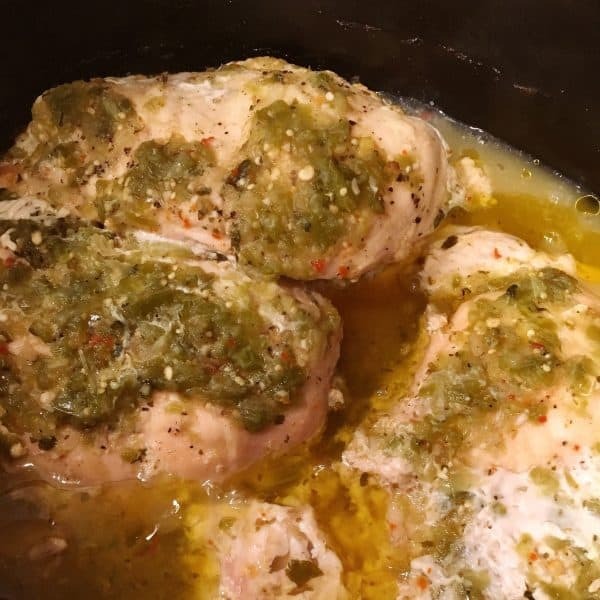 This makes a big batch of chicken and is great for group parties, large family dinners, and pot luck dinners. I use half and freeze half. It freezes well and reheat’s beautifully. To make Cafe Rio “soft tacos”…toast flour tortillas over a gas flame on your range or in a hot skillet. 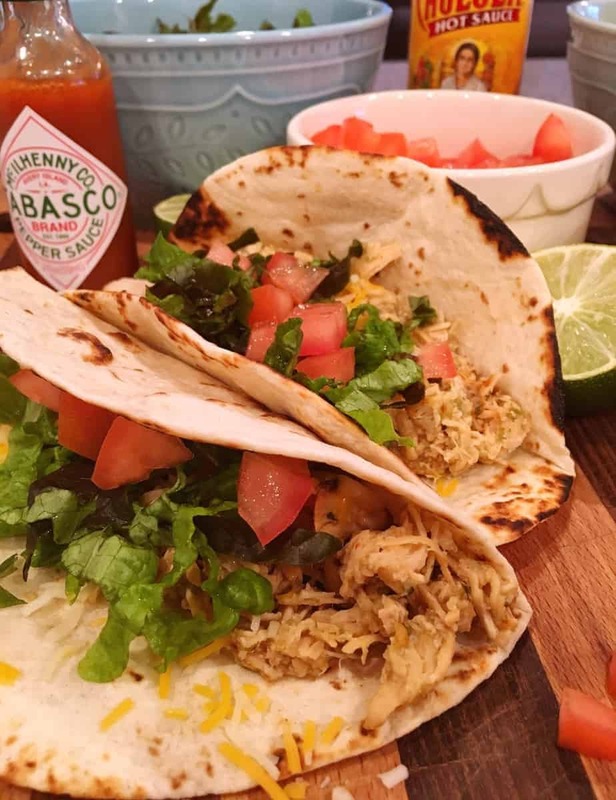 Add the slow cooker copy cat Cafe Rio chicken, top it off with shredded lettuce, grated cheese, fresh diced tomatoes, olives, sour cream and homemade Guacamole. Any and all of your favorite toppings. You can find my recipe for Homemade Guacamole HERE! It’s a quick easy recipe that can be used in multiple dishes and one the whole family will enjoy! I love it’s versatility, flavor, and ease. I hope you’ll enjoy it too! Be sure to leave a comment if you give this recipe a try! I’d love to hear from you. I’m sharing this easy family friendly recipe over on a few of my favorite link parties. Click the links below to join the Fun. Thanks for stopping by my Nest! Remember to follow me on Facebook, Pinterest, and Instagram. 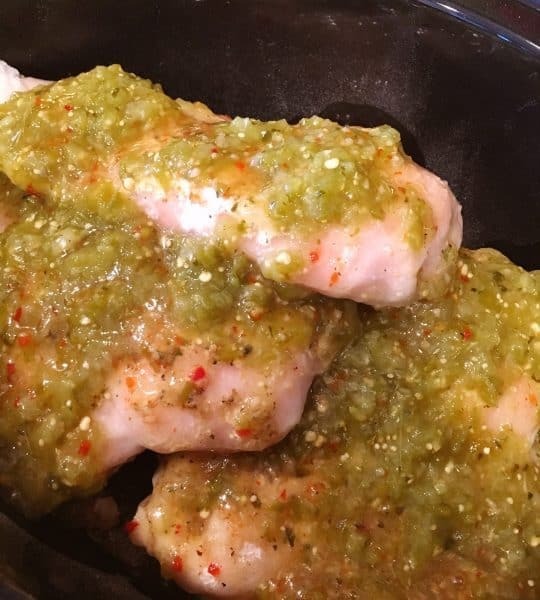 Slow Cooker boneless skinless chicken breast in a flavorful zesty chili verde sauce. Tender, juicy, and perfect for all your favorite Mexican dishes. 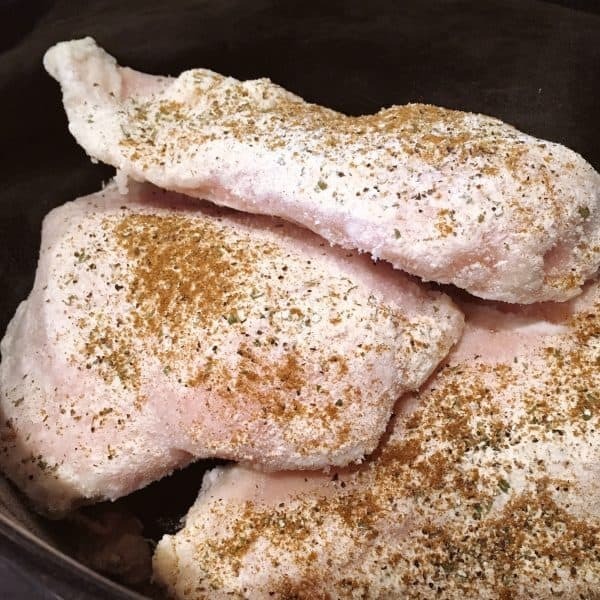 Place boneless skinless chicken breast in bottom of slow cooker. Sprinkle with Ranch dressing mix and cumin. Cover and cook on low for 6 hours for thawed chicken or 8 hours for frozen chicken. Shred chicken and mix with juices. 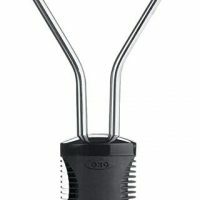 Cover and keep warm until ready to serve. Oh my goodness! It’s so nice to see ya here on my little corner of the web. Thank you so much for stopping by! Still thinking of that beautiful reception! You are so talented! Let me know if you like this recipe. My family loves it! I love how easy it is.